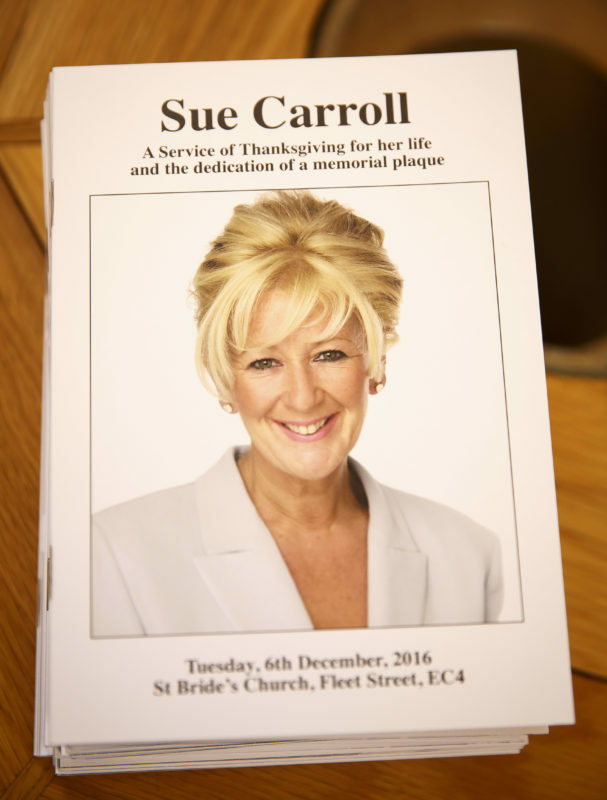 Around 20 serving and former Fleet Street editors turned out at St Bride’s Church for a memorial service in honour of former Daily Mirror columnist Sue Carroll.  She has been awarded the rare of honour of memorial plaque at the journalists’ church in recognition of her 40-year career in newspapers. Former Mirror editor Piers Morgan, Sun columnist Jane Moore, Daily Mirror editor Peter Willis and TV star Paul O’Grady (pictured below) were among those who paid tribute to Sue, who lost her battle with pancreatic cancer on Christmas Day, 2011, aged 58. Former Daily Mirror columnist Sue Carroll’s plaque dedication service at St Bride’s Church, Fleet Street, London. 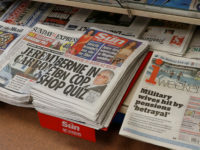 She had been a senior executive on The Sun, the News of the World and the Daily Mirror before making her name as a widely-loved and respected Mirror columnist for the last 13 years of her life. Among the congregation was News UK chief executive Rebekah Brooks, Mirror Group editor-in-chief Lloyd Embley, The Sun editor-in-chief Tony Gallagher, Daily Express editor Huw Whittow, Sunday Mirror and People editor Gary Jones, Sun on Sunday editor Victoria Newton, The Sun deputy editor Simon Cosyns and Mirror Online editorial director Pete Picton. 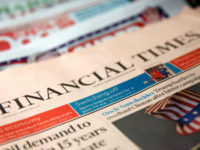 Former Fleet Street editors included Piers Morgan, Stuart Higgins, Sir Nick Lloyd, Lady Eve Pollard, Richard Wallace, Tina Weaver, Colin Myler, Andy Coulson, Phil Hall, Wendy Henry, Neil Wallis, Dominic Mohan, Craig MacKenzie and Paul Connew. 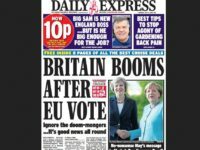 Among columnists who attended were Alison Phillips, Jane Moore, Richard Littlejohn, Nick Ferrari, Amanda Platell, Kevin Maguire, Andrew Pierce, Carole Malone, Kevin O’Sullivan and Paul Routledge. Also there was Lord Guy Black, Mark Bolland and Society of Editors executive director Bob Satchwell. But friends also remembered Sue’s love of champagne, shopping, cigarettes and fur coat…her sense of fun as well as her her journalistic skills. Close friend Paul O’Grady, led the tributes to Sue saying: “I loved that lady, she was wonderful. “Sue was feisty, outpoken, beautiful, glamorous and compasionate. She fought for the underdog, she was fair minded and great fun to party with. O’Grady read out tributes from two other pals who were unable to attend through ill health – Sir Bruce Forsyth and Dame Barbara Windsor. And Dame Barbara added: “Sue was such a special lady – a great journalist and, I am proud to say, she became a friend. 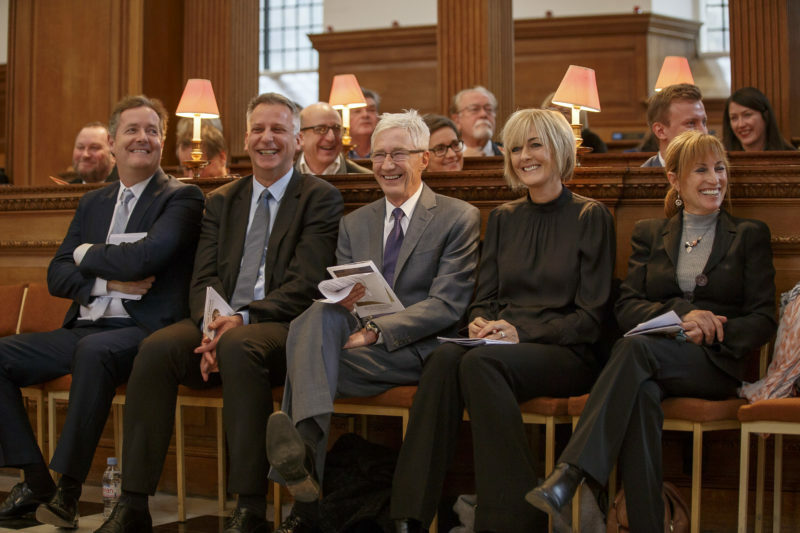 Guests, who also included TV stars Richard Madeley, Judy Finnigan and Paul McKenna, gave Sue a rousing round of applause before the choir sang one of her favourite songs, Abba’s Dancing Queen. 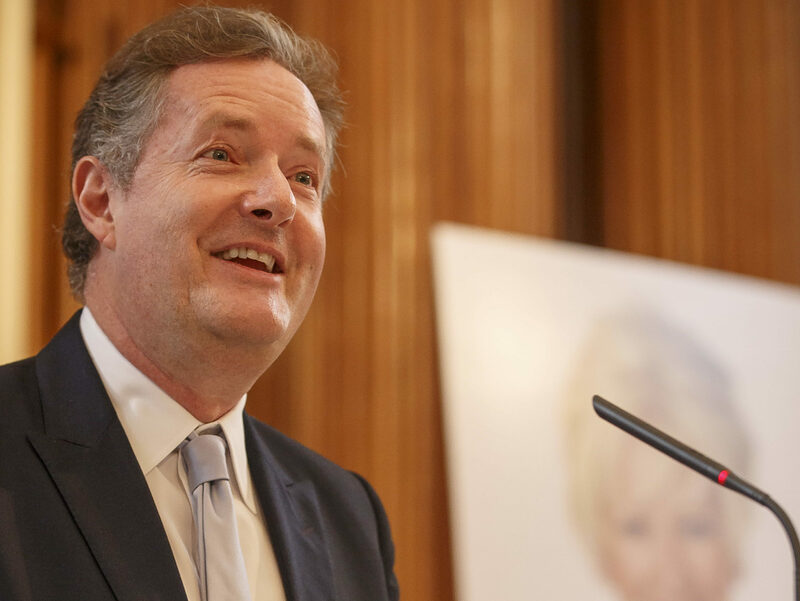 Former Mirror editor Piers Morgan shared memories of working with Sue at The Sun and the Daily Mirror at the service on what would have been Sue’s 63rd birthday on December 6th. Piers told how he first met her when he was a “fresh faced 20 year old working on the Bizarre column” in the late 1980’s and she was “one of the single most exciting things I had seen in my sheltered village life.” He remembered her love of high heels, fur coats and low-cut frocks, calling her “a glamorous firebrand hybrid of Bet Lynch and Liz Taylor”. He recalled hiring her as a weekly columnist for the Daily Mirror in 1998. He said: “I remember telling her and her eyes lighting up, followed by a cigarette, followed by tears. ‘This is my dream job,’ she told me. ‘This is what I’ve always wanted to do’. “It turned out to be a dream for the Mirror too. Sue was a natural. For the next 13 years she became the true voice of the Daily Mirror both in print and on television when she became a frequent guest on chat shows, with the likes of Richard and Judy or Alan Titchmarsh. He said: “Her intro to a Luciano Pavarotti interview read: ‘He is shaped like a large, triangular Dairy Lea slice, vast, wide shoulders and a huge chest supported on skinny legs.’ And Pavarotti loved it, even after someone finally explained to him what a Dairy Lea slice was. “Sue worked ferociously hard, she played even harder. She drank Jim Davidson under the table, she shimmied Michael Flatley off the disco dance floor, she cried her eyes out with Marti Caine and she cavorted around practically every country in the world with Sir Richard Branson. “The only constant in Sue’s personal and professional life was noise – a lot of raucous, profanity-ridden, laughter-filled noise. “The one thing she loved more than a good gossip was a good argument. Some of my favourite arguments in the world were with Sue Carroll – usually about splashes, or what she thought the splash should be. “Such was her devotion to newspapers that she once deliberately burned off her face in a £4,000 Harley Street beauty make-over for the Daily Mirror. Her face remained vivid red and blotchy for weeks – not from the treatment but from the volcanic rage which erupted when the then editor Richard Wallace informed her that she wasn’t going to be the splash. Former Sun journalist Fiona Webster recalled how Sue had started her career at Jackie magazine, under Nina Myscow. Sue’s friends Peter Willis read a lesson and Judy McGuire read a poem. Rival columnist, the Sun’s Jane Moore, said Sue battled her cancer with grit and courage and made a mantra of the Chumbawumba song “I get knocked down, but I get up again”. And she read an extract from Sue’s poignant, final column in which she spoke movingly of her cancer. A huge photo of Sue smiled down from the altar as the Rector, the Reverend Canon Dr Alison Joyce, blessed Sue’s plaque – marked with a photo, candle and a bottle of champagne. 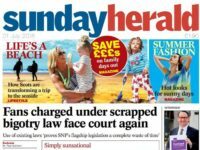 She said Sue had been a caring mentor to younger journalists and “a woman with a great sense of justice and fairness, always ready to support the underdog”. There were hymns, readings, and the choir sang another of Sue’s favourite songs “That’s Amore”. And the congregation rose to their feet and clapped as The Dixie Ticklers New Orleans-style band played everyone out with a rousing renditon of When the Saints Go Marching in. 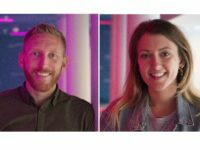 Then Sue’s friends and colleagues adjourned to a nearby bar, the City of London Distillery – taking her larger-than-life photo with them. It stood behind the bar, nestled amongst the bottles of champagne and Chablis as her friends raised a toast.